9-1/2" x 15" x 12"
18-1/2" x 10-1/2" x 6-1/2"
At first look, Linda Huey's ceramic sculptures resemble fantastic flowers from another world. On closer examination, these plant-like figures, made jewel-like and stony by glazes and fire, reveal a complex hybridization of botanical forms and modern construction materials. Each piece expresses an individual persona through its shape, color, and structure. 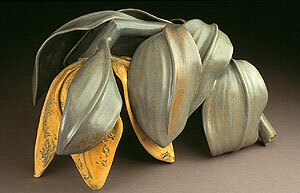 "Soldier Flower" (2005), medium-fire clay and glaze, metal bolt, 11" x 19" x 11"
The largest work in the exhibit, Upside Down, Right Side Up, offers multiple interpretations depending on how one looks at the ends of the long stalk. Does the shiny, bulbous end resting on the ground resemble a flower or an opening seed? Does the branched end at the top imply upended roots or charred branches? Made of medium-fire clay and glaze, rebar*, and epoxy, Strong One suggests a struggling survivor. The ceramic blossom appears to float out into space like a stalk of seaweed in water. What does it mean that this graceful, dun-colored plant grows out of what looks like a mass of tubular pipes? Soldier Flower, with silvery leaves and sand-colored tulip head, wilts and surrenders to gravity. Imprints of tiny toy soldiers mark the petals like ants on food. The colors of the piece are those of the uniforms of Americans fighting in Iraq. Other figures, such as Thrown Flowers and Midnight Sky, though clearly not of our world, take their colors from nature's exquisite palette. Totem presents a plant with four distinct segments that appears to grow out of a small blue disk with textured markings. Huey embeds references to our materialistic, throwaway culture in the surfaces of some of her works. Using a plaster mold that she made from discarded items she found in the streets near her Boston studio -- a toy truck, nuts and bolts, other detritus -- she presses wet clay into parts of the mold. She then uses the pieces of clay that bear the mold's textures to construct different sculptures. Trash Background Wall Piece is one that suggests a fossilized relic. 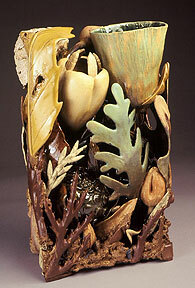 "Clay is my pathway into the natural world, and my concern for the environment influences my sculpture," she comments. "The work that results portrays how I see our culture's ambivalences." In addition to free-standing plant-like sculptures, Huey creates pieces that are constrained to rectangular shapes, such as Come Back Tomorrow and Remainder. Resembling a concrete block, Remainder's red brick-colored perimeter is a conglomerate of what looks like encrusted hardware and junk. Breaking through from the inside is an aquacolored fresh flower -- a contrast to its container. Come Back Tomorrow has a variety of leaves and blossom forms that tightly conform to the shape of a box. Huey's art reminds us that inside the hull of a seed, a miniature plant waits to grow, and that in places we might least expect it, a tree will sprout. She says, "I ask the question of what our society values, and how fragile or strong nature will have to be to handle it." *Rebar is a steel rod with ridges that allow it to adhere to concrete, used in making reinforced concrete for the construction industry.